They often appear to be the friendliest creature on the planet – having previously been seen socialising with kittens, dogs, and even monkeys. 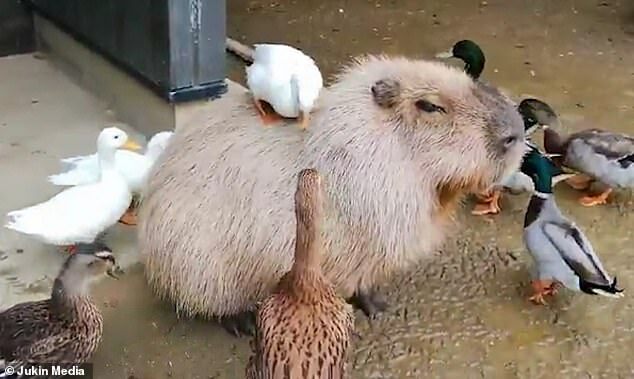 And the capybara has showcased its warm nature once again, this time with a collection of clingy ducks in Nagasaki Bio Park, Japan. Footage captures the group of birds clambering over the world’s largest rodent and giving the laid-back create a groom with their beaks. Eager for their furry friend’s attention, the multi-coloured ducks continually peck at the capybara, who doesn’t seem to mind the intrusion. Racing around the creature’s body, the curious birds rush to find the most comfortable spot near the large rodent. The capybara can grow to around four feet in length and weigh up to a whopping 145lbs. It is a highly social semi-aquatic mammal that lives in groups as large as 100, and is native to the forests and marshes of South America. 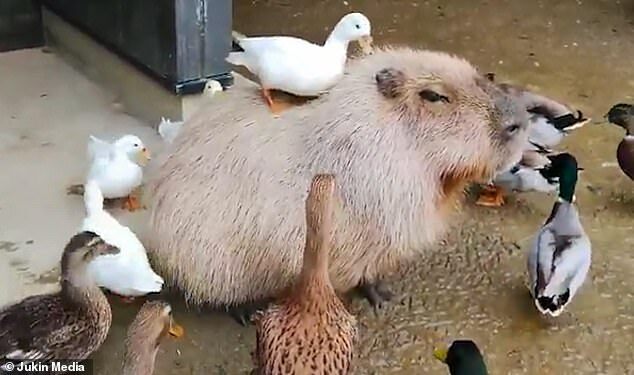 While uncommon, the capybara’s intelligence and gentle nature means they can be kept as pets, as long as they have access to a sizeable pool, grass to graze on and friends to keep them company.